Like many animals that spend a lot of time killing other animals, humans have binocular vision - two eyes looking in the same direction. When you look at something, you actually see two images of it, from slightly different angles, which your brain then combines into a single three-dimensional image in a process called "stereopsis." While this helped us climb the food chain, it poses a problem for any form of entertainment that tries to believably depict anything on a two-dimensional surface - like, say, video games. You can create three-dimensional models interacting in three-dimensional worlds. You can exploit other cues the human brain uses to determine depth and distance, like parallax and changes in size. You can make wildly spinning objects zoom into the player's face at every opportunity while "THIS IS MODE 7. NEAT, HUH?" flashes across the screen in bright red letters, just in case the effect is too subtle for some people. 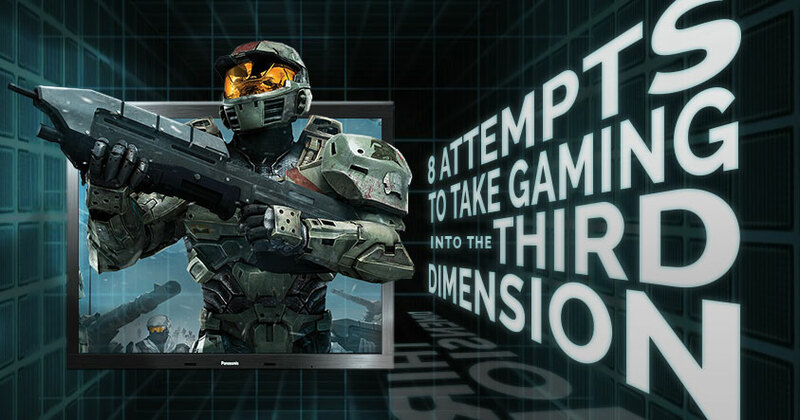 But you can't actually place a three-dimensional object with depth in front of the player's eyeballs. Nonetheless, this hasn't stopped developers seeking to create the most immersive possible experience - or at least an interesting marketing gimmick - from creating gaming hardware intended to do the next best thing and trick the player's brain into seeing 3D objects anyway. Luckily for these devs, the human visual system is actually embarrassingly easy to fool, as anyone familiar with optical illusions can attest. Unluckily for them, the part of our nervous system that processes questions like, "Is seeing Mario play tennis in eye-gouging red monochrome worth $180?" is usually at least a little more discerning. So, gird your eyeballs as we explore eight of the devices developers have used to add three-dimensional visuals to their games. 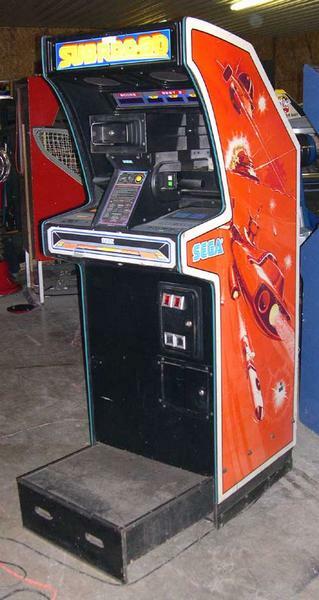 Appearing in arcades in 1982, Sega's SubRoc-3D was a first-person shoot'em up that put players at the controls of a submarine fighting hordes of hostile ships, airplanes, and UFOs. As a game, it wasn't particularly remarkable, but its presentation was. Rather than looking at the screen directly, players peered at it through a periscope-shaped contraption containing two spinning disks, each half-opaque and half-transparent. The monitor displayed two slightly shifted versions of the same image, one intended for each eye, and rapidly alternated between them. The discs' spinning was timed so that one of the player's eyes was always obscured while the other had a clear view, alternating in sync with the shifting image on the screen. The synchronization of eyepiece and screen meant that each eye saw only the version of the image intended for it. Voila, 3D! This is one of the most common types of 3D display technology: the active shutter system. Modern active shutter 3D devices have replaced mechanical whirling discs with layers of liquid crystal in front of each eye that go from transparent to opaque and back again as electricity is applied, but the fundamental principle remains unchanged. As a game, SubRoc 3-D was a fairly run-of-the-mill shooter. The technological marvel of its 3D visuals was also undercut by Sega's decision to save money with cheap, unreliable motors that sometimes led to the discs getting stuck. Nevertheless, as the first 3D videogame, it has certainly earned a place in history.